Troika's public artwork "Shoal" combines sculpture with architecture and technology. 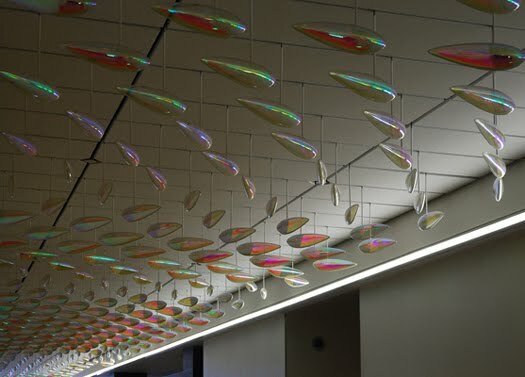 Spanning across a 50 meter long corridor, 467 fish-like objects wrapped in iridescent colours and suspended from the ceiling rotate rhythmically around their own axis to display the movements and interdependency typical to shoal of fish. The ceiling architecture is set in motion and appears liquified changing the spatial experience of the corridor while opening up the surrounding architecture infinitely towards Lake Ontario. 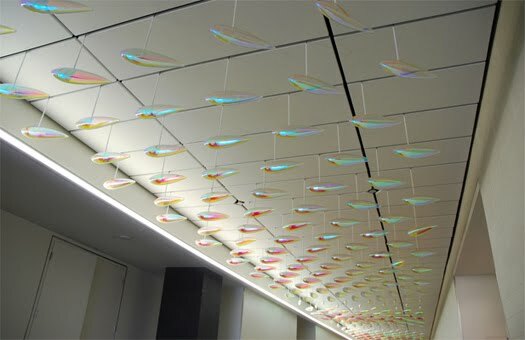 Shoal was curated by PAM (Karen Mills and Justin Ridgeway) and commissioned by TEDCO as a permanent installation for the Corus building located at Toronto’s Waterfront, Queens Quay East.